The P-43A-1 is a gift Rank II American fighter with a battle rating of 2.7 (AB/RB/SB). It was introduced during Update 1.69 "Regia Aeronautica" in the Operation S.U.M.M.E.R. event of 2017. 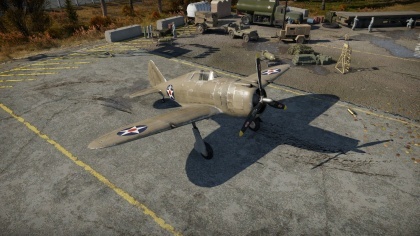 The P-43A-1 is very similar to the P-47 Thunderbolt in terms of looks since the P-47 was developed from the P-43 in real life. 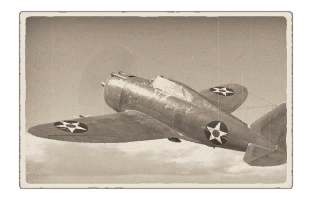 Although similar to the P-47, the engine of the P-43 is rather weak compared to the one of the P-47. Nonetheless, the P-43 is fast for its BR range and when downtiered it can be a menace for the enemy team if used correctly. The P-43A-1 is a Boom & Zoom fighter. Although classified as a Boom & Zoomer, it can still turn with many aircraft except for Japanese fighters. It can turn with anything Russian as long as flaps are used and still retain its energy. Climb above all of the enemy aircraft then start Boom & Zoomin. If you get caught in a bad situation, use your turning ability to dogfight and beat the enemy. The P-43 is a Boom & Zoom aircraft, however if needed it can turn fight with many aircraft, unfortunately most Japanese fighters will out turn this aircraft. Bf 109 F-4s and Japanese fighters are your main worries. The Bf 109 F-4 is a very good energy fighter and a better climber than the P-43. The Japanese fighters such as the Ki-43-III and the A6M2 and the A6M3 Zeroes turn a lot better and climb quite well. You will need altitude in order to Boom & Zoom against Japanese fighters. In spite of only having 4 x .50 calibre machine guns, the P-43 can engage and kill bombers if necessary. If flying against the P-43, a smart Bf 109 F-4 pilot will attempt to energy trap him. Make them overshoot then try to reverse and get behind the P-43. Japanese pilots should always attempt to turn fight a P-43, however watch for the P-43 to attempt to gain altitude in order to set up a Boom & Zoom. Watch for an opportunity to sweep in right behind them and try to force a turn fight or maneuvers which will bleed the P-43 of its potential and kinetic energy. The P-43 Lancer was designed by Alexander de Seversky of the Republic Aviation Company as part of a contract for the United States Army Air Corps. About 272 planes were made until the P-43 Lancer was discontinued from production. 125 of the P-43 Lancers were assigned to the Far East China Theater as part of the American Volunteer Group (nicknamed "Flying Tigers"). The P-43 Lancer would be obsolete very quickly as even more modern and superior planes were being pushed out. The P-43 Lancer would leave a legacy as it would shape the design of the P-44 Rocket which would become the famous P-47 Thunderbolt. The P-43A-1 has only been available in Operation S.U.M.M.E.R. of 2017 that lasted from 28 July to 28 August. It was unlocked after obtaining 7 pilot Marks of Distinction. Bombers B-10B · PV-2D Harpoon · BTD-1 Destroyer · A-26C-45DT · PBM-3 "Mariner"
This page was last edited on 20 February 2019, at 04:24.